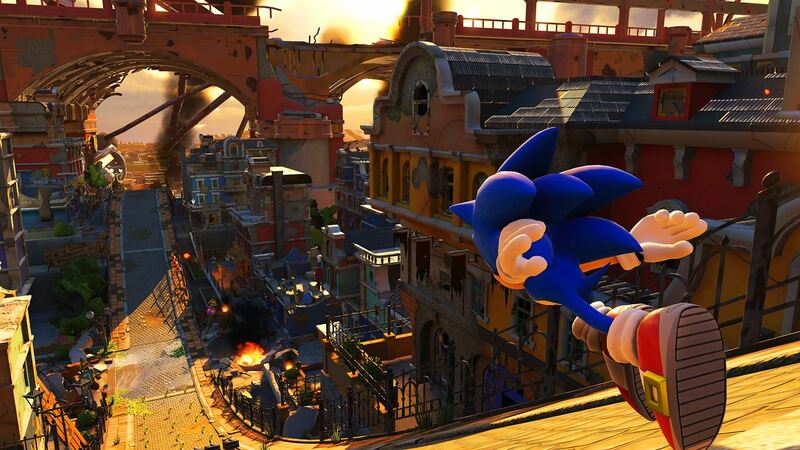 The game starts with Sonic running through Green Hill on his way to stop another Eggman attack in the city. From this stage, it is clear what the game is presenting us with. The level looks great, but is undone somewhat by how it is designed – and that is pretty much throughout the game. The controls of Sonic are also stiff, with a homing attack lock-on that can’t decide whether it wants to work and visible shifts in speed instead of a natural flow. After beating the stage, Sonic stops the robots attacking, then royally gets his spiny blue tail handed to him by Infinite. And this cutscene shows how the rest of the story plays out. It is tonally confused, to put it mildly. This is Sonic getting knocked unconscious by his enemy, and starts with some powerful hits until it devolves into some comedic piñata pummelling. It’s as though the balance is being shifted too far in one direction after already being in the perfect position. After a bit of text explaining that after Sonic’s capture Eggman conquered the world, but a small band of resistance still fights, the avatar comes into play. Choosing from one of seven species [dog, wolf, hedgehog, bird, bear, cat, rabbit], you’ll then choose from several options such as colour of fur and skin. Later there’ll also be the chance to add clothing accessories to the character that unlock upon completion of missions. In terms of gameplay, the avatar is a bit worse off than Sonic. Lacking a spin dash and ball jump, the avatar fights with Wispons – weapons that use the power of Wisps – to defeat enemies. Also equipped with a grappling hook that is used to replicate a homing attack, the jump of the avatar is floatier than Sonic. As with Sonic, speed gain isn’t natural flow. And this is also the case for Classic, who also sports a very botched jump. Landing on enemies doesn’t carry momentum, but crushes it. As for automation claims… That’s weird in its own right. Rolling down hills carries a bit of momentum that usually allows Classic to get around loops, but there are still speed boosters aplenty. And all three characters have sections that remove control entirely for a bit of spectacle. There are also stages where Sonic and avatar team up, where control switches between the two depending on which specific action you do. Boosting swaps to Sonic, whereas using a Wispon will swap to avatar. These are possibly the poorest levels of the game, since if you accidentally press the wrong button by mistake [and fumbling the controls can happen when using a Wispon is on the right trigger instead of the more sensible choice of the left action button], the character automatically swaps, and if it was that left action button you pressed – enjoy a trip to the last checkpoint if you were anywhere near an open space. The story is a simple one, with Eggman using the Phantom Ruby’s power in Infinite to make him incredibly strong. With this Ruby’s power, Infinite can make reality warp and create a new one that will affect anyone the user wants. This brings Zavok, Chaos, Shadow and Metal Sonic into the loop, but you’ll only ever fight two of them. Zavok is near the beginning, and in a way proves that when not restricted the physics can work. Zavok is the only battle fought by Sonic in an arena, and aside from the homing attack lock-on, works incredibly well. Yeah, there’s no way to speed great distances, but movement is fluid enough that if the restrictions were removed from other levels [and they had a bit more depth] it would improve playability. Metal Sonic is fought on an endless loop of a runway, and so are most of the other bosses as well. Chaos is reduced to a quick kill when Classic appears, and the Shadow illusion is taken out by the real Shadow. Both of these could have had some form of a boss. Classic fighting Chaos would be in a 2D space as usual, but it could have been a perfect way to start Classic’s entry in the fight. And Shadow, well add another arena fight. Have him use Chaos powers in unique ways after each hit. The fights against Infinite are a royal pain in the backside, as is the final boss. If you hit the illusion cubes, be prepared to dodge attacks you can barely see due to the red hue messing up vision. 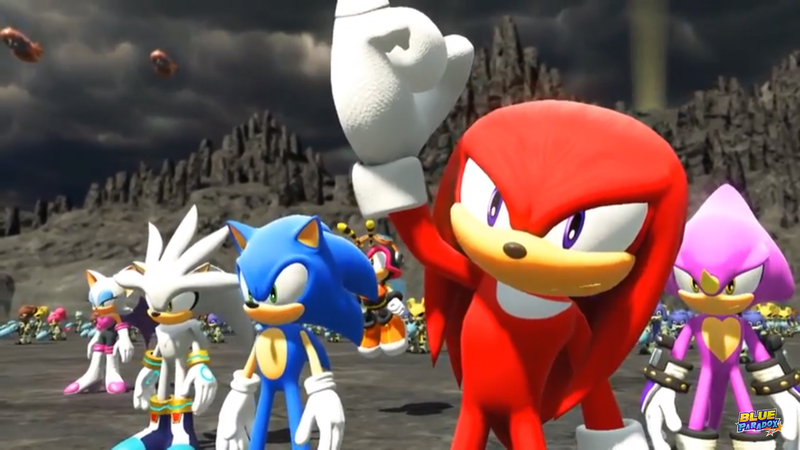 The resistance is made up of familiar faces, with Knuckles taking on the commander role. He has a much better characterisation here, and most of the cast get a small time to shine with dialogue and interactions. Silver is here, playing the careful planner to Knuckles’ hot-headed nature. Espio, Vector, and Charmy represent Team Chaotix. Amy is around, as is Rouge. Tails rejoins the main force later on – having lost it due to Sonic’s disappearance. And Tails is really the only one to have regressed as a character, though that really happened in Unleashed. It’s just more prominent here. Back in Unleashed, Tails lost the Adventure developments to become a tech-wiz with little combat ability. With Forces, he is seen a few times near the beginning to cower in fear of robots and Chaos. When it comes to some true action, again he is on the sidelines. 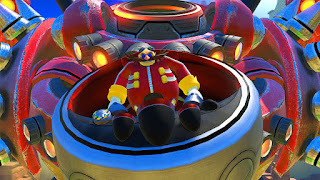 Eggman is always on the attack, and since he is the genius of the bad guys, it seems bad to keep Tails from fighting back. The music in the game is not the best, but still has some shining moments. Most of it blends together due to the over-use of synths, but there are a few stand-outs, such as the world map theme and the avatar stages. The avatar stages have vocal tracks on par with Adventure 2’s. Think of the treasure hunting themes or a few of Shadow’s, and that’s the general feel of those offered here. Voice acting for the most part is fine, though audio logs on the map screen sometimes get lost while the music is playing – especially Shadow and Silver, who for some reason sound quieter than other characters. Now, for everything I’ve been saying, you would think this was bad. However, that’s the thing. Frustrating at times – yes. Unplayable – no. There is nothing game-breaking here. It’s just a case of getting used to the quirks it presents. Yes, some of them are larger ones – such as the control of characters – but with the lives system gone, it’s just a case of try, try again. There is fun to be had here, and if you care to do so, there’s enough extras to keep anyone happy. Collecting red rings within stages unlock extra levels. There’s five in each, and sometimes can be within easy reach, other times presenting a bit more of a challenge. Arbitrary replayability is forced in the avatar stages, where swapping Wispon to reach some of the red rings is required. Completing daily missions give perks, which make earning those S-Ranks easier [and you’ll be needing it on some stages]. The regular missions unlock more equipment for avatar, and these come in all varieties. Completing stages, earning an S-Rank in stages, using moves of characters, completing stages under a certain time… There’s a lot of them. Some missions will also give Wispons with added perks, such as score bonuses with each 100 rings collected, or increasing speed when grinding. There are also SOS Missions that present themselves in regular stages, which challenge you to one of three objectives. Two of them are based on avatar – using a random avatar, or a rental avatar. The other is with Sonic or Classic, and requires finding a pod within the level to free animals before completing the level. The avatar ones are easy enough, just requiring learning a different set-up. Finding the animal pod is harder in some cases, as multiple paths mean it can be missed if you don’t explore enough. So… Recommendation time. It’s difficult to really say. 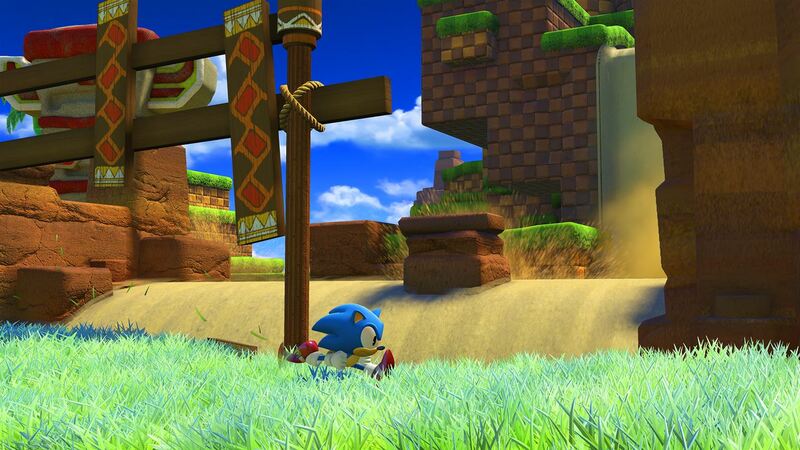 If you are a Sonic die-hard or want some platforming speed, other boost games can provide much better. However, if you are on consoles, this is the only boost game available on the current systems – at least until Unleashed and Generations get put on the Xbox One’s Backward Compatibility program or HD remasters of the two are released. The avatar creation system is fun to play around with, and testing out all of that on the stages can provide some entertainment. There’s wish fulfilment in that, for those who want it. If you know, like me, that you will replay stages just because of the fun in doing so, then by all means buy away. However, as a general buying guide, wait until it becomes cheaper. There’s not much here that hasn’t been done before in the series. While shorter, Generations is still the go-to game for boost gameplay, or Unleashed for some true spectacle.